What Is NI Motion Control? NI motion control is for NI test, measurement, and control platforms. NI offers C Series drive and drive interface modules for CompactRIO and EthernetRIO, as well as PCI and PXI plug-in motion controllers. Engineers are using LabVIEW system design software, versatile controllers, and a complete drive and motor portfolio to build advanced motion applications faster and at a lower cost. Motion systems typically consist of application software, a motion controller, drives, motors, and mechanical components such as gearboxes and stages. Learn more about each of these components in the sections below. The following pieces of the motion control architecture are implemented at different hardware component levels depending on the application: application programming, supervisory control, trajectory generation, trajectory interpolation, and control loops (position, velocity, torque). They are traditionally split between a development machine, a real-time motion controller, and drive firmware. Components below the application programming level are typically executed deterministically to meet the control and I/O requirements of the motion system. 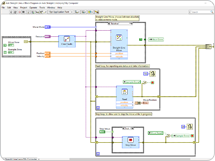 NI has two separate architectures for deterministic execution of these components: (1) plug-in motion controllers and (2) LabVIEW real-time targets as motion controllers through the LabVIEW SoftMotion Module. The SoftMotion architecture blurs the lines of these traditional components, giving you the flexibility to design a custom motion system. The plug-in motion controller architecture follows a traditional well-defined model for the placement of the components. The two different motion architectures offered by NI (see Architectures tab) are programmed with different software. Applications using NI plug-in motion controllers are programmed with the NI-Motion driver and the Motion Assistant, whereas applications using NI real-time controllers and FPGA targets are programmed with the LabVIEW SoftMotion Module. SoftMotion is an implementation of software-defined motion control, where the various motion control components, such as supervisory control, trajectory generation, and the control loops, are modularized. Each component is then targeted to the most appropriate part of the motion system (development machine, real-time processor, or FPGA) as suits a particular application. You can use SoftMotion to develop advanced applications out of the box, or customize it at the application code, real-time SoftMotion Engine, or FPGA IP level. With SoftMotion, use the LabVIEW project to quickly configure motion axis settings, simulate axes, bind axes to hardware, and test and tune a motion setup before developing an application. After an application is developed, you can run it on the development machine connected to a real-time controller executing the SoftMotion Engine, or deploy it to an NI real-time controller to run stand-alone or through communication to a human machine interface. Easily integrate third-party EtherCAT motor drives into your SoftMotion application with the SoftMotion Drive Interface (SDI). 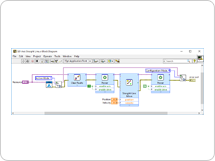 Download existing SDI plug-ins from the LabVIEW Tools Network or create your own using the LabVIEW project template provided by SoftMotion. With the SDI, you have a standardized method for integrating any EtherCAT drive into your application. Use the legacy NI-Motion driver to program PCI and PXI plug-in motion controllers (NI 7330, NI 7340, NI 7350, and NI 7390). This driver consists of LabVIEW VIs and examples to help you quickly create motion control applications using the plug-in controllers on either LabVIEW for Windows or LabVIEW Real-Time. The two fundamentally different motion architectures offered by NI (see Architectures tab) use different controller options as well as different software. Applications using NI plug-in motion controllers are programmed with the NI-Motion driver and the Motion Assistant, whereas applications using NI real-time controllers and FPGA targets are programmed with the LabVIEW SoftMotion Module. You can use any LabVIEW Real-Time target as a motion controller with SoftMotion, including PXI, CompactRIO, Single-Board RIO, and NI industrial controllers. The LabVIEW project is used to configure motion axis settings, test configuration, and tune motors. SoftMotion provides the supervisory control and a powerful trajectory generator, which are automatically deployed to the real-time controller alongside your motion system settings and application code. With a LabVIEW Real-Time target as a motion controller, you can customize motion functionality and deterministically integrate with measurement I/O or vision for force feedback or vision-guided motion applications. The NI 7330, 7340, 7350, and 7390 series PCI and PXI boards are motion controllers based on digital signal processors and programmed with LabVIEW using the NI-Motion driver. NI plug-in motion controllers are available in two- to eight-axis variants for both stepper and servo motor control. You can use each of these controllers in a Windows or a LabVIEW Real-Time system and integrate them with NI DAQ devices for high-performance automated test systems. They are also compatible with the Motion Assistant, a reconfigurable interactive motion prototyping tool. NI provides reliable, easy-to-connect motor drive solutions for NI embedded controllers in a variety of power ranges and form factors. NI embedded controllers also work with many third-party EtherCAT drives. C Series drive modules integrate drive electronics directly into a CompactRIO chassis for a rugged, embedded motion solution. The LabVIEW SoftMotion Module is shipped with extensive ready-to-run examples for these modules and FPGA IP blocks for drive control components to get you up and running quickly. Drive control is implemented in LabVIEW FPGA allowing low-level customization of algorithms normally implemented in external drive firmware. All four modules are single axis. The NI 9505 is a full H-bridge module for driving brushed DC servo motors, relays, lamps, solenoids, and valves. The NI 9503 is a stepper motor drive and the NI 9502 is a brushless servo motor (BLDC or BLAC PMSM) drive. C Series drive interfaces for CompactRIO offer direct connectivity to hundreds of stepper and servo drives. These modules provide servo or stepper drive interface signals for a single axis. In addition, they offer a full set of motion I/O including inputs for a home switch and limit switches, incremental encoder inputs for position feedback, and digital input and digital output lines. The NI 951x drive interfaces include a processor to run the spline interpolation engine and the patented NI step generation algorithm or control loop. The AKD brushless servo drives feature cutting-edge technology for a single motion axis. They provide plug-and-play configuration with AKM brushless servo motors and connect to motion controllers either through an analog control signal or deterministic EtherCAT communication. From an NI real-time target with two Ethernet ports, you can implement motion systems that use EtherCAT communication to directly connect to EtherCAT drives. You also can take advantage of NI 9144 EtherCAT expansion chassis and C Series drive interface modules to connect to an AKD through analog control signals or step and direction commands. Because they are based on the same technology, local (analog control) and distributed (EtherCAT) motion axes can be combined within the same controller. 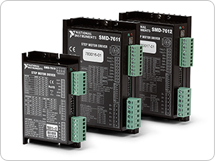 SMD series stepper motor drives provide reliable, easy-to-connect cabling solutions for NI motion controllers. 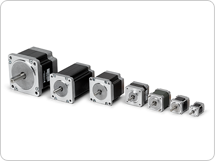 NI offers one-axis power drives with high-torque output, microstepping, and antiresonance control. The SMD-762x series AC input power drives offer 120/240 V bus and 5 A peak current output, and the SMD-761x series DC input power drives offer 12 to 75 V bus and 8 A peak current output. NI has direct connection solutions for connecting SMD drives to the NI 9512 C Series drive interface module or simply over Ethernet. The SoftMotion Drive Interface (SDI) allows plug-and-play integration of third-party EtherCAT motor drives with SoftMotion. 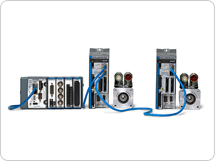 Download and install SDI plug-ins for a variety of third-party drives from the LabVIEW Tools Network to get started on your motion application. NI brushless servo motors provide superior dynamic performance, offer plug-and-play configuration through smart feedback technology, and are perfectly matched with NI servo drives. NI brushless servo motors incorporate low-inertia rotors and stand out due to their low-cog, low-harmonic distortion magnetic design. AKM brushless servo motors provide superior dynamic performance, offer plug-and-play configuration through smart feedback technology, and are perfectly matched with AKD servo drives. AKM brushless servo motors incorporate low-inertia rotors and stand out because of their low-cog, low-harmonic distortion magnetic design. 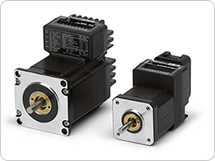 NI stepper motors provide precise, high-torque performance and easy connectivity to NI stepper motor drives. Because of their brushless design, rugged bearings, and innovative cooling technology, these motors offer long-term durability. The two-phase design ensures small and precise movement in 1.8 degree increments (200 steps/revolution) and is simple to control. NI integrated steppers are high-performance motor+drive units with analog and Ethernet connectivity options. They are designed for simple setup, yet they contain advanced drive control features to meet demanding application requirements. An integrated encoder option is available for applications that require motion and I/O measurement synchronization.